You’ve just gotta trust me on this. Because I know dessert. Especially the frozen kind. I’ve been taste-testing ice cream and sorbet ever since I was old enough to buy something from the Good Humor man. I’ve had encounters with Ben and Jerry and Edy and Rita. Have had every incarnation of ice cream and sorbet all over the world (i.e., cowed in Ireland), and been disappointed time and again. I found my nirvana in a specialty store in my Pennsylvania back yard. A pint of chocolate sorbet because I was in the mood for something light, sans creme. Yeah, right. The label says it all. It really is like frozen fudge. And who doesn’t like fudge? It’s made by Zsa’s, a Philadelphia outfit. They make some luscious-looking ice cream, too. 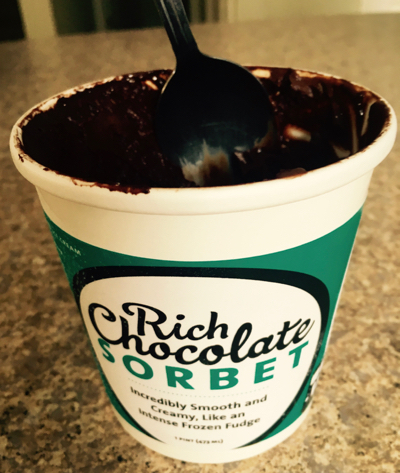 The sorbet’s so decadent, I haven’t felt a need to move on to the harder stuff. They’re all over the Philly area, including the city’s famed Reading Market. So check ’em out next time you’re there. Sow worth it. This entry was posted in Eats and tagged best desserts, chocolate sorbet, food, Philadelphia, Reading Market, travel, Zsa's ice cream. Bookmark the permalink.